The new small and robust interrupter is a switching unit that can be used in conjunction with both modern switch mode and also older style Thyristor based Cathodic Protection systems to provide a controlled power interrupt. Because of this, the unit has inherent surge and overload protection, to protect itself from both load surges and rectifier failures. The unit is designed to be fitted into existing cabinets and connects to existing rectifier units. 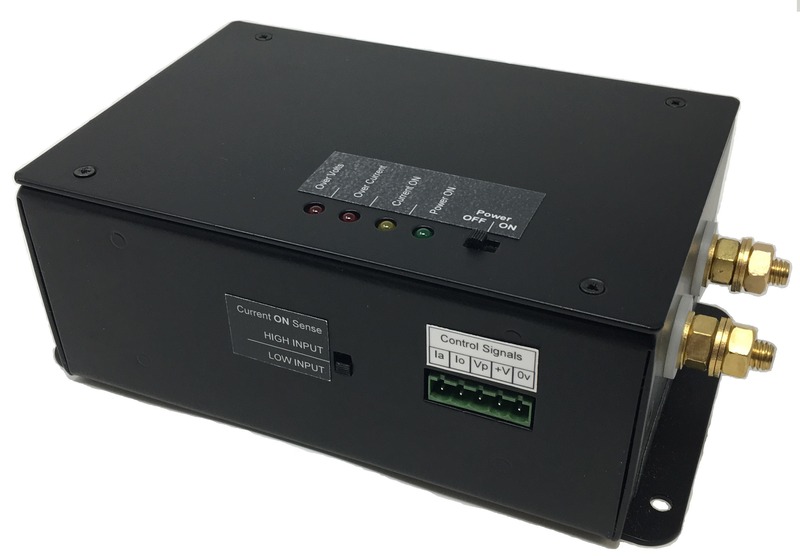 It is efficient and capable of switching up to 50A at voltages up to 100V peak. The unit has a polarity switch for either positive or negative logic and is driven by external control modules. The unit has detachable fixing wings that can be used directly or reworked to provide alternative fixing points. The wings allow for the unit to be mounted onto a back plate or it can be left free standing. Designed to run from a 12V supply, connected via a 5 way signal connector on the front of the unit. There are additional connections for an optional current monitor. The interrupter has been designed to work with both positive and negative logic for signal pulse, this function is selected using the switch on the front of the unit. The unit has been designed to be inherently fail-safe. This means if power is lost to the unit an internal relay engages to ensure the output switch is forced ON, this ensures the rectifier is connected to the load. It also features a Bi-directional MOSFET design that allows it to absorb power spikes safely and operate highly efficiently so that even at full power there is very little heat generated. For further information about our standalone Cathodic Protection interrupter.